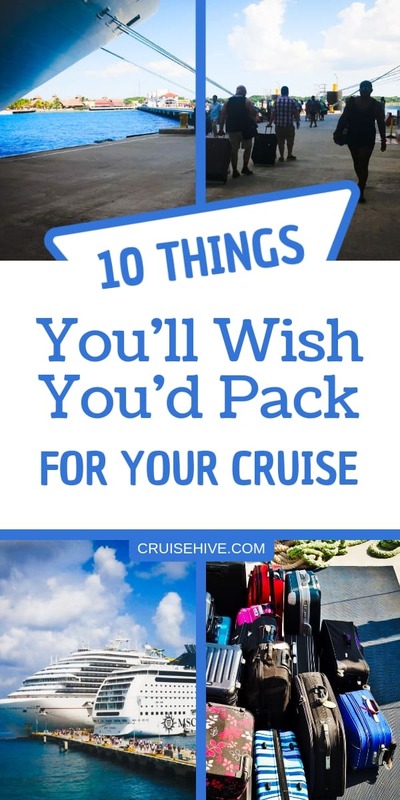 We've all gone on a cruise and wished we brought that item so we're here to make sure you pack those items to make your cruise vacation better. Whether you are cramming gear into small bags to avoid airline luggage fees or you are overpacking for fear of leaving something necessary behind, packing for any vacation can seem endless. Few cruise passengers will forget basics such as sunscreen, a swimsuit, or formal attire, but once you’re onboard, you may wish you’d found room in your bags, totes, and carry-ons for these cruise essentials. Outlets are notoriously sparse in cruise ship cabins, and if you have several devices to recharge, need a CPAP machine, or use different hair styling tools, you’re going to be juggling those few plugs. A power strip can dramatically increase the available outlets, and a couple of short extension cords can help you arrange what you need exactly where you need it. And don’t forget the appropriate chargers and adapters for your devices! Amazon has many Travel Adapters to choose from for your cruise. There is so much going on each day on a cruise, it’s easy to forget about that trivia contest, dance lesson, cooking demonstration, shopping sale, port lecture, liquor tasting, comedy show, pool game, or other activity on your must-do list. A highlighter will come in handy for you to mark up the daily newsletter so you don’t miss out on anything you really want to do. Sharpie or even Bic highlighter markers can be purchased on Amazon. Your cruise ship card is your room key, on board identification, and ship-wide charge card, but it won’t handle charges off the ship, such as renting a locker during a beach excursion, tipping a fabulously funny bus driver, or paying for that quirky little souvenir. Also, if you want to tip your cabin steward or room service attendants a bit extra for their hard work, cash is most appreciated. Cash is also necessary for playing games of skill in the casino or arcade, where just $1 can win you fabulous prizes – if your hand-eye coordination is good enough. The sea air may be fresh and bracing, but your cabin and its teeny bathroom won’t smell so good with wet and dirty clothes, smelly shoes, room service food, or the inevitable results of overeating or overindulging on alcohol. A simple room spray or a hanging freshener can do wonders to keep your cabin smelling clean and fresh. Check Air Fresheners from the popular Amazon site here. Most cruise ship cabins do not have any alarm clocks, and while you can arrange a wake-up call through the ship’s phone service, it is a good idea to have a backup alarm ready so you don’t miss the early departure time for a popular shore excursion or your scheduled debarkation time. Setting an alarm can also help you enjoy an afternoon nap without missing any upcoming activities. Amazon has so many Travel Alarm Clocks which you can buy for your upcoming cruise. A comfortable pair of slip-on shoes, sandals, or slippers will be welcome footwear on board the ship. Instead of lacing up sneakers or putting on uncomfortable heels for a quick trip to the buffet, to play a round of miniature golf, or to wander over to a trivia contest or craft project, you’ll be glad you have more casual footwear to make walking across hot or slippery decks safer and easier. Here are a selection of different type shoes you can buy for your cruise. Cruise ship cabins are air conditioned, but the power of the air conditioner can vary greatly depending on the ship and individual cabin locations. A small travel fan can create a nice breeze to circulate air and keep your cabin much cooler, and the fan’s white noise can make sleeping even easier as you rest up for another fun-filled day. A fan can also help you dry off swimwear or damp shoes much more quickly so you can wear them again. There are a lot of good travel and Portable Fans on Amazon right here. There is always a packed schedule on a cruise vacation, but there are times when you want to arrive at activities early – to get the best seats for the nightly show or to be in the lounge for a comedy act, for example. While you’re waiting for the fun to start, a pack of playing cards or a fun travel game can pass the time. This will also be very helpful on debarkation day, when you may spend an hour or two waiting in a lounge before it is your turn to leave the ship. You can choose from all of these Travel games from Amazon. Staying hydrated is essential on a cruise, when exposure to salt water, not to mention warmer temperatures, can dry your skin out. Staying hydrated will also help keep you healthier and more energetic so you don’t miss a moment of your vacation. Instead of paying for expensive bottled water or struggling to bring your own water on board, just bring a reusable bottle you can easily refill whenever you’re thirsty. Purchase Travel Water Bottles from Amazon. There is so much to see in port and just watching over the side of the ship, you’ll wish you had better eyesight. A pair of binoculars can be the best thing you bring on your cruise vacation, whether you plan to use them while watching for whales or dolphins from the ship, scouting out ports as you sail into dock, or taking them along on shore tours for an even better view of everywhere you visit. You can check all the Travel Binoculars from Amazon here. What essential items do you always bring along on a cruise? Share your must-pack tips in the comments! Also, check more Cruise Hive cruise packing tips. When you're preparing for your cruise vacation you'll need to make sure you pack right. Here's what you should wear on your cruise with some tips and suggestions. Lot's of cruise outfit ideas for your packing list. Ideal suggestions for sailings in regions like Alaska and the Caribbean. 50 things on what to pack for an Alaska cruise vacation including items you might have never thought of. Check these for your cruise packing list.